A Frittata in a crockpot? You bet, it's brilliant. A fast, easy, and delicious breakfast. 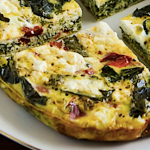 Made with kale, roasted red pepper, and feta it's low carb and gluten free. Heat the oil in a large frying pan on medium-high. When the oil is hot, add the kale and saute until it's softened into a flat layer, about 3-4 minutes. If you're using a regular slow cooker, spray it well with non-stick spray or oil and transfer the cooked kale to the slow cooker. Drain and small dice the red peppers. Slice the green onions and crumble the Feta. Add the chopped red pepper and sliced green onion to the slow cooker with the kale. Salt & pepper to taste, then sprinkle on the Feta. Cook on low for 2 - 3 hours, or until the frittata is well set and cheese is melted.